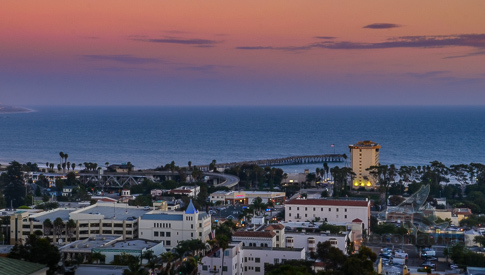 The seaside California City of Ventura‘s downtown and pier glitter in this summer sunset stock photo of the travel-friendly community. Golden light fills the sky as buildings and streetlights add their glow. In the distance but clearly visible one can see the large flag flying above the end of the Ventura pier at the end of California Street, which runs prominently like a river through this photo. NOTE: We have additional aerial views and ground shot pictures of Ventura and Ventura County. Please contact us to see samples. Download this high resolution Ventura stock photo today. Another from our stock photos category designed to be images for website and more – download stock photos as soon as your order is placed!